As an actor, singer and all around entertainer, there's very little Michael York hasn't accomplished throughout his storied career thus far. The Englishmen has found a wide array of roles on the silver screen and stage, ranging from the underground appeal of "Logan's Run" to guest spots on "The Simpsons" and "Curb Your Enthusiasm" to his wildly hysterical role as Basil Exposition in the classic cult series "Austin Powers." But his latest character covers entirely opposite terrain, reuniting the beloved star with his Broadway base and giving him the king of all roles in Lerner & Loewe's "Camelot." And throughout the two and a half hour top notch production, York lived up to his King Arthur title, masterfully playing a part steeped in drama, intrigue and even splashes of comedy, served up within his signature style. Even though the musical has been produced countless times since its Big Apple rise to fame in the 1960s, the current revival seeks to reach a younger generation via the familiar face and a fresh coat of paint in general to the historic storyline. Though scholars debate on the details surrounding King Arthur's life, the plot points out the most treasured essentials of his legacy, including the implementation of the Knights of the Round Table and a slew of political complications. 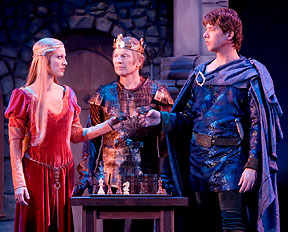 Yet as the cast opened the show with the familiar numbers "I Wonder What the King Is Doing Tonight" and the appropriately titled "Camelot," it was clear that at least each of those theatrical elements would remain in tact. Aside from York's stellar acting ability and occasional bits of comic relief, the cast was co-led by Rachel York (no relation) who played his beautiful bride Guenevere. She displayed a far reaching, near operatic range throughout several selections (such as "Before I Gaze At You Again"), but her appearance turned from innocence to lustfulness when engaging in a controversial affair with the eyebrow raising knight Lancelot (played by James Barbour), eventually illustrated through "I Loved You Once In Silence." But as the main characters battled to save their marriage, underlying political tension took center spotlight, not to mention themes of violence and all out war. In that regard, the storyline jumped right into the present political spectrum, hitting incredibly close to home given the ongoing status of discord and tension between America and the Middle East. 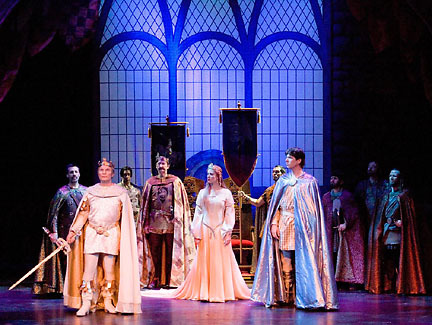 Between the chilling parallels among the two vastly different eras and sheer entertainment provided by both Yorks and company, "Camelot" is capable of reaching an even more diverse audience than it did during its original debut. And yes, that includes those swinging "Austin Powers" hipsters who are still longing for days of peace, love and some shag-a-delic satisfaction. 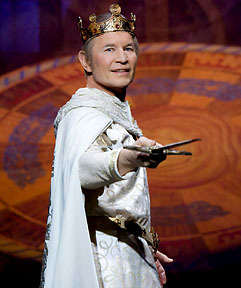 Michael York continues his lead role in "Camelot" through May 13 at Chicago's LaSalle Bank Theatre. For additional information, log onto www.BroadwayInChicago.com or call 312-902-1400.